I'm late but I haven't forgotten. Last week I posted about how much I enjoy the art, books, and blog of Susan Branch. I've put together a few things that make me think of her. The person who wins will receive a copy of Christmas Joy which is an adorable book filled with sweet thoughts, traditions, and recipes. 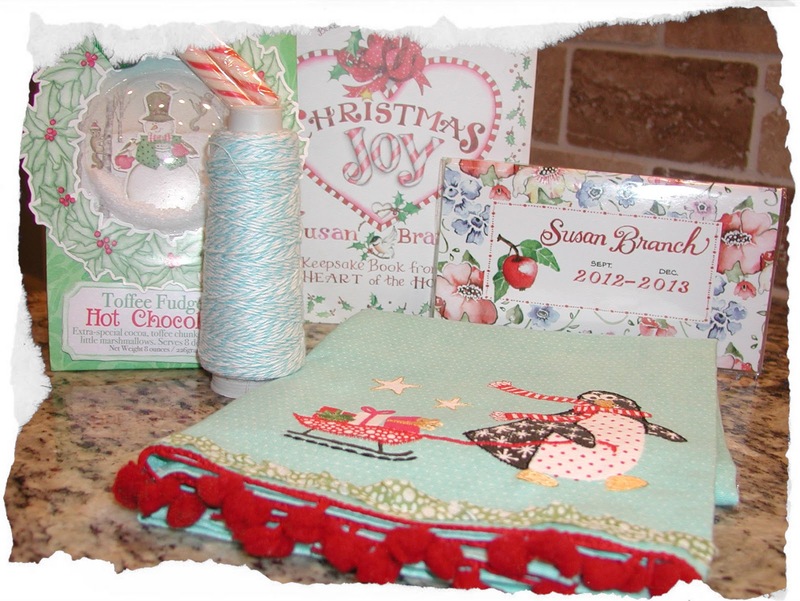 A Susan Branch pocket calendar for 2012-2013. Delicious hot chocolate for cold winter nights. An adorable dish towel to adorn your kitchen. And some twine for crafty moments. Just leave a comment here or in the previous post where I talked about Susan. If you've commented in the last two posts at all, I will include you. How about we draw on Sunday? I love Susan Branch books and things. Will you enter me in your giveaway? Merry Christmas. I love Susan Branch's art, too. I've collected her books (especially her recipe books) for years. This is truly a generous giveaway. ANyone would love to win it! Susan Branch is so fun! I always like Susan Winget drawings growing up also. What a fun assortment of things! I feel so silly! I did not realize until this morning that I haven't been seeing your blog posts for quite sometime. I have always followed your blog, but for some reason I haven't been getting updates. I've added you to my sidebar again & now I'm anxious to catch up seeing pictures of your new home in Texas. Thank you so much for your encouraging comment about our loss. wow! Could Susan's blog be any cuter!!! Please throw my name in the hat for this giveaway. How fun! Count me in!! Thanks for hosting this great giveaway and for the chance to win! This would be a dream come true! I don't have any of these things and would enjoy them SO much! I mentioned her blog on mine yesterday, as you know! She is such a special lady. Thanks girlfriend! Holiday hugs! I love Susan Branch. What a neat giveaway. Please enter me. What a sweet giveaway! So enjoyed stopping by and saying hello! Wow! Just found your lovely blog via Sugar Pie Farmhouse. I adore and follow Aunt Ruthie and Susan Branch. Please throw my name the pot for the giveaway. Thank you for being so generious! wow! what a sweet giveaway -- everything is just so dawgone cute, so 'susan branch.' thank you for this opportunity! Please count me in, I love Susan too! What a great give a way, so glad I got here in time! What a sweet giveaway, Stacey. Love how the colors all coordinate. Don't you just love bakers twine? I've always loved Susan Branch. Just read Willard and am so inspired. Thanks for offering this and please enter me.